Mining Tools – A bonus to mining skill and maybe other perks. Well, it’s a bit different from before. For one, one no longer need to have mining skill, at all, in order to mine Draenor ores. All you need is your Garrison. 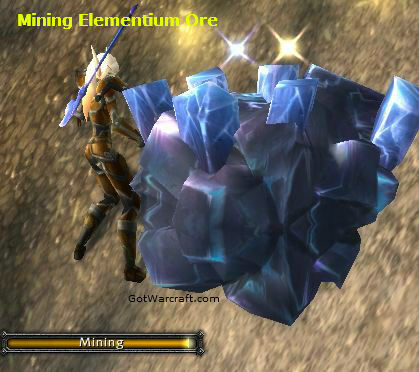 You do need to have mining as a skill to mine the ores that are scattered about Draenor and the rest of the world. Mining nodes in your own garrison will help raise your skill level and they do award XP if you’re not yet 100. Skill level for general mining is no longer required, you can mine the open world ores, anywhere, with a skill level of 1. The catch is that you will only get ore fragments until your skill is high enough. Ten fragments can be combined, with a click, into one ore piece. You can also sell them on the Auction House if you like. Once you enter Draenor you should, if you already have mining, find a scroll (as a loot drop from mining any node) that will raise your level cap from where ever it currently it to level 700. It only raises your cap, not your skill. You still have to level it as before. Why mine instead of just using your Garrison mine? If you need more ore or if you need the older ores for selling or crafting. Also you’ll be able to get more Primal Spirits. These are traded for other materials, just talk to the Primal Trader in your Garrison. Mining is a great little money maker and is easy to level. Several professions demand ores and the bars that miners can create from those ores. Both items sell well on the Auction House. Smelting is the process of making your ores into bars and doing so will increase your mining skill. Gather 40 pieces of copper ore and then smelt them. You can do the same with most of the other ores, as well. It’s perfectly possible to level your mining to the max ranks by buying each of the various ores off the Auction House and then smelting them into bars. This is expensive, but it can be done. Under level 90 you’ll have to mine in the open world. At 90+ you can use your garrison mine. Blacksmithsneed bars to level their profession. Auction house traders who will sometimes buy out your ores (if you price too low) to resell at a higher price. Mining provides XP. The higher the level of the node the more XP is provided. Nodes that are gray to you might also provide XP, depending on your level, your skill level, and the node’s level. If you are in a group the XP is split among the group, just like the XP from mob mashing. Ores prefer some shape to their terrain. In any given zone travel along the edge of the hills and mountains. Skip the flat areas, ores rarely appear there. Sometimes you’ll find nodes underwater. You’ll want a (flying) mount for leveling up mining, It’s painful otherwise, especially at the higher skill levels where the nodes are spaced out across the entire map making gaining skill tedious. When you pick up your Mining skill you will also get Smelting. With Smelting you turn the raw ore into usable bars. Smelting ore into bars will also level your mining skill. It’s entirely possbile to leveling your mining skill from nothing to the level cap just by smelting ores. Buy the ore off the Auction House (or from other players) and smelt away. Just be sure to keep upgrading your skill so that you can be smelting ores that will actually level your skill. Where’s the ore? A general rule of thumb is “anywhere the terrain isn’t flat.” Hill, mountains, ravines, boulder piles, underwater, etc. Keep notes on where nodes pop up and you find more easily. Consider grabbing the Tycoon Addon. Among other things Tycoon will put modify your main and mini maps to show mining routes for a variety of ores. If you’re 90+ and in Draenor you’ll find a scroll, when you mine your first node(s), that will raise your level cap to 700. You will also no longer need to see a trainer to raise that cap. Even if your skill is 1. Under 90 you will still need to see the trainer every 75 points to raise your skill cap, though you can still try to mine any node regardless of your skill. 1-75, Apprentice Mining, Requires level 1, Train up at 50+. All the starting zones, except Teldrassil See below for more detail on the starting areas. This used to be a good ore to mine to get your skill up (from 50,) but it’s now a quest item and cannot be used to level your mining. N. Stranglethorn and other lev. 20 zones. Thousand Needles, Badlands, Burning Steppes, Searing Gorge, other areas of the same level. Train to at least 200 skill before moving onward. Keep mining Thorium until 275. Hellfire Peninsula and most Outlands areas. Get to at least 325 before moving on. Optional ore. it has no value other than as a hand in for part of the Netherdrake quests. Find it in the floating islands off the southern edge of Shadowmoon Valley. Borean Tundra, Howling Fjord, and other Northrend zones. Get to at least 400 before moving on. Outlands: Nagrand, Blade’s Edge Mntns, other Outlands zones. Sholazar Basin, Icecrown, other Northrend zones. Train up at 425 and you should be at least 425 before moving on. Deephome and the higher Cataclysm zones. 525-600, Zen Master Mining, Requires level 80, train up at 500. After 525 there are no skill-ups to be gained by smelting ores. You can find either of these from Trillium veins. As of patch 5.3 these can be mines with skill level 1! You just won’t get as much ore as you would with a higher level skill. Rumor has it that veins mined during the day (server time) will return more white ore and at night tiime, more black. Mining this still will take you the rest of the way to 600 skill. Congratulations on your maxed Mining skill! Leveling, Achievements, Professions, and more, Level 90 faster than ever. Updated for all the latest patches, Get yours here, now. Toughness – Your Profession Perk from Mining. Toughness is dead in Warlords of Draenor. Regular picks and specialty picks and weapon picks. There’s a lot to pick from. Ok, fine, most are quest items, but a number are weapons and you can start a pick collection. Even at max level you will have an effective 610 skill with the appropriate item. All the item names are linked, even though they might not look like it, so hover over them for the item info. Grimeo’s Mining Pick None Just a quest item. Reinforced Mining Pick +15 Not in game, was a test item. Crystal Mining Pick None Alliance – Quest item for this. Mining Pick +10 Your basic mining pick, sold by everyone. Ancient Pandaren Mining Pick +10 Requires level 85, does not need to be equipped. Various weapon picks Click through that link to see the various items. None add anything to your mining skill. Gnomish Army Knife +10 to mining, herbalism, skinning, and maybe other skills. Will also pick you nose, scratch your back, and has a Whirly Thing, just in case. In Warlords remember that you can start mining anywhere, or even skip it entirely and use your garrison mine. If your skill is too low, in areas other than your mine, you just get fragments until your skill is higher. This part’s the really easy part, it should only take around 40-50 nodes at most and they spawn like crazy all over the starting zones. Teldrassil alone has no ore, of any kind. All the other starting zones are full of the stuff. You can get the rest of your mining points by smelting your ore into bars and you will need to hit a skill of 50 before moving beyond copper. Humans: Humans start in my favorite mining zone, Elwynn Forest. Seriously, it’s full of the stuff. Just run up to Goldshire, head along the path past the large lake and pick up what’s down there, and then check out the area surrounding the Logging Camp. Just doing this should gain you almost everything you need. Hitting the mountains at the top of the map should yield a few copper veins, as well. Generally every single ore spot will have 2-5 mobs nearby or on top. Keep a lookout for groups of mobs. Dwarves and Gnomes: Given the general association of Dwarves with Mining you’d think the Dwarf starting area would be the best place to start, right? Well, if you did, I’m here to inform you that your intuition is correct. Although *my* favorite zone is still Elwynn Forest, Dun Morogh takes the cake as copper king. It’s rather simple here actually, just run around everywhere with the ore detector running and you’ll be at 50 in no time, at which time you can train up and start mining and smelting tin. Night Elves: Sadly for you NEs it seems that a lush forest enviroment isn’t condusive to the production of precious minerals, (eg: copper,) so you’ll have to head down to darkshore to start your skill gain. Once you’ve reached Auberdine head for the cliffs, east, and mine everything on the way. The moonkin caves along the way generally hold 1-4 spots each, sometimes actually at the very back of the cave itself, and should get you a bit of skill before you hit the cliffs. The cliffs themselves hold a medium amount of ore, following them south will yield a good amount until you hit ashenvale. Once you’ve done this head west to the edge of the forest/coastal area and then north back up to Auberdine. Follow this pattern in a semi-square/circle until you hit that 50 skill. Draenei: The Draenei areas also have plenty of ore. Just run along the hills and mountains and you’ll load up in short order. Both Azuremist and Bloodmyst isles are good. Worgen: Gilneas has a pretty fair amount of ore, as well, mainly in the southern areas, between The Blackwald and Greymane Manor, and the northest, around Emberstone mine. Undead: Your journey to gain mining skill as undead will begin at Deathknell, this is a fairly easy zone to mine due to it’s somewhat simple map design, not much in the way of big barriers, walls, annoying bugs, etc. to stop you. First thing to do is to head south following the cliffs all the way around till you hit undercity, run past as the city contains no ore, continue to follow on until you hit the Bulwark/Western Plaguelands and then north up to the scarlet monastery. After you’ve hit the monastery skip around it and down to the coast, follow the coast west till you hit the cliffs again, at those cliffs head south to our starting point and loop again. Orcs and Trolls: Orcs and Trolls have it easy, just like the Dwarves/Gnomes, it’s something of a just run back and forth around the huge barren red wasteland of a starting zone with ore finding on, get stacks, make a profit. Tauren: Mulgore is rather simple, it’s a big flat plain with ore along the corners. Just run around the edges of the zone with ore detection on and mine everything in sight, although personally I find mulgore to be the most boring zone I must say it’s also the least complicated of them all. Blood Elves will find copper ore all over Eversong Woods. Same rules: follow the edges and hills. While mining is a great little money maker there are a lot of other things you can do, beyond mining, to make tons of gold. Crafting, for one. Playing the Auction House for another. Learn it all from one of the richest players in all of WoW. Your link to tycoon addon is broken. Lots of ghost iron can be found in the Greenstone Quarry at the north part of Jade Forest. lol and i mean a decent amount!